Hello lovely nail geeks! Today I have Blush Lacquer’s third installment to her Pink Panther series through Hella Handmade Creations! 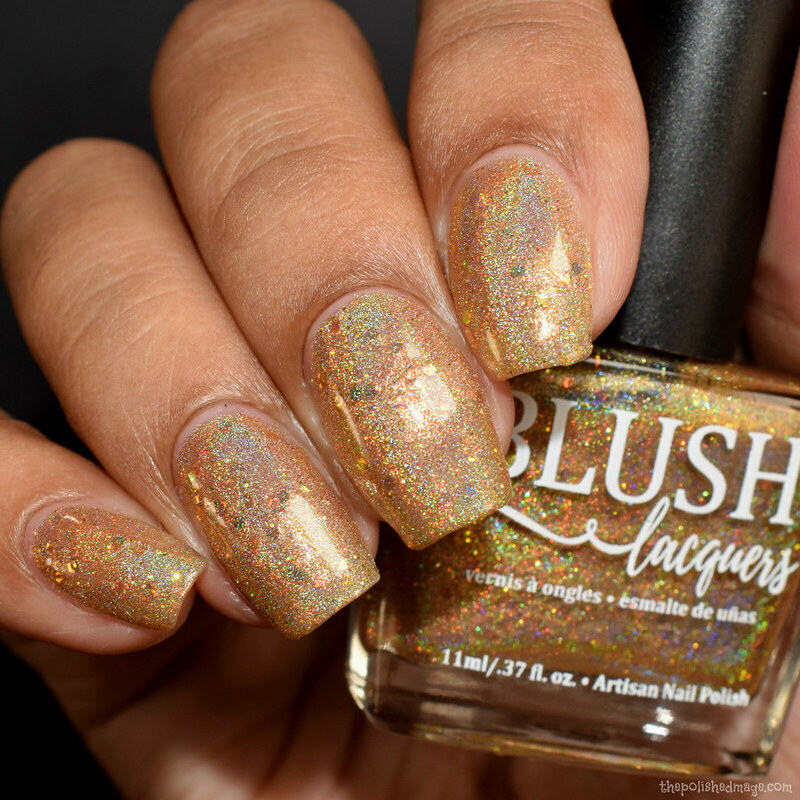 So far we’ve seen some gorgeous holos in this line and this one is no exception! Pink Tail Fly– a caramel honey linear holo base with small gold holographic glitters and larger iridescent shifting glitters of green, gold, orange and red. Swatches show three thin coats with glossy topcoat. Formula has a light feel that I think depending on nail length will be opaque at 2-3 coats for everyone. The holo effect is very strong, and the glitters picked up easily and laid down flat for me. You’ll see them sparkle in the full array of reds, greens, oranges and golds. I had no texture after topcoat. There is no cap on Pink Tail Fly and a full size bottle will be $11.50. You can grab this color starting Wednesday, November 14th at 12:01am EST to Wednesday, November 21st 11:59pm HST (Hawaiian time). Don’t forget to check out the swatch video to see this beauty in action!